Home » What’s the Sleepopolis’ Platform Bed Frame? This is a question I receive fairly often through my comments and contact form. So a short post featuring the Sleepopolis’ platform bed frame is long over due. 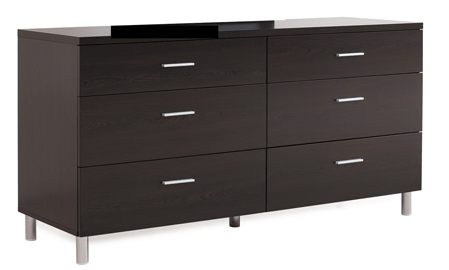 The name of our platform bed is the Bellmar by Copenhagen Imports. Unfortunately, Copenhagen Imports is not a national retailer. They are located in Arizona and also in Texas. They will ship this platform bed, or any of their products, beyond Arizona or Texas, but it will be at an extra cost. 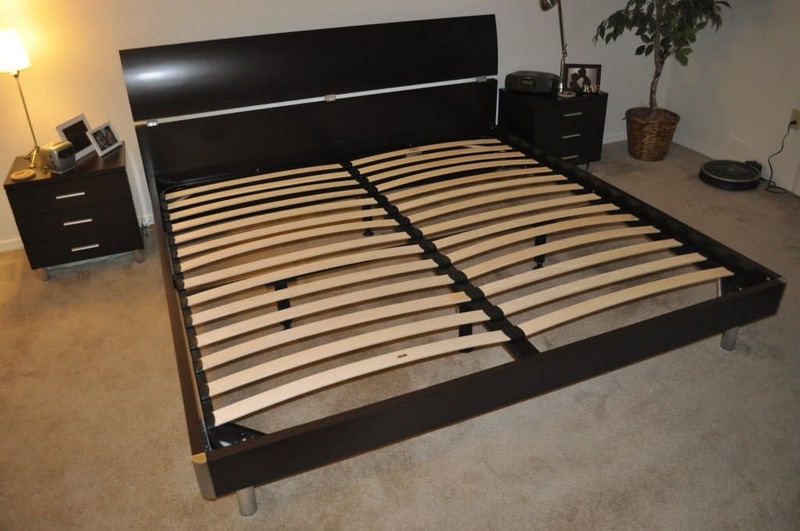 While I love the design and style of this bed frame, the slat configuration it uses is less than ideal. You will note that these slats are flexed outward. This creates less support than rigid board slats or a solid platform. Additionally, this type of slat frame can invalidate the warranty of some mattresses (or at the very least, decrease their performance). Heavier weight sleepers are most likely to see performance issues. As a work around, you can place a 3/4″ sheet of plywood on top of the slats, use a low-profile boxspring, traditional boxspring, or bunkie board. For more information on foundations see our guide on boxsprings and platform beds. My wife and I shopped for this platform bed for several months. During that time I feel like we probably looked at every bed frame, platform or otherwise, at every major retailer within 50 miles of our home and online as well. I had a certain price point in my head when we were shopping. Needless to say I was quite shocked at what we were finding. We spent a lot of time at IKEA.com and in-store. I bought desks from IKEA last year that we’re very happy with, as well as other smaller items. However, none of the beds at IKEA felt or looked like they would survive a move. Additionally, we just really didn’t like the aesthetic of any of the IKEA beds. Copenhagen Imports is less than 5 minutes from my home. However, the name scared me off for several months. I couldn’t imagine any reality in which we could find a bedroom set for under $3K in that store. However, that’s exactly what we did. 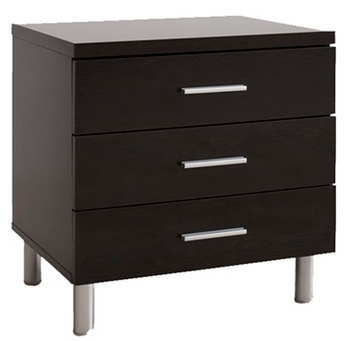 We were able to get a King sized Bellmar platform bed frame, 6 drawer dresser, and two night stands right at $1,500. I know we certainly could have found better deals elsewhere, however we really just loved the modern looked of the Bellmar. It’s clearly a piece of quality furniture that will be with us for many years. My husband is 6’2″ and about 280. I want to get a hybrid mattress as we need good edge support. I had been looking at the Saatva, but am concerned it might not be good for someone as big as him. I was wondering what you thought of it vs the Sapira or the Alexander Hybrid Nest. Thanks so much for your site. Based on your review we bought our fist Leesa Queen and we just bought another for our summer home. What we need now is a platform for the second bed. WE’ve seen your frame reviews but we’re looking for something that isn’t so close to the floor and maybe closer to “traditonal” height. Any advice? I have not seen elevated platform beds like that, but I am sure they do exist somewhere. You may be better off with a more traditional frame, or simply going with a low platform bed and placing a wooden foundation on top of it, that will give you the height you are looking for. Unfortunately, there are not many great options available online currently. Thanks for your really informative reviews! I already have an Ikea Trysil bed and I would like to purchase a Leesa mattress. However I have heard (also from Leesa directly) that the curved slats are not good for the Leesa mattress. What would you recommend? Should I buy new flat slats? Should I get a bunkie board? What do you think is best? Thanks! Either or is a good option. Both will add a good level of support. Honestly, I would say go with whichever route will save you the most money. You can’t go wrong either way. Thanks! Would it be better to put the bunkie board on top of the existing slats or should I just ditch those slats all together? Thanks! In an ideal world, it would probably be best to replace these slats with a new slat configuration. But the bunkie board would be a more simple solution. Do you have the plywood measurements for King Size Bellmar you used? I ordered same frame and want to get a head start on the plywood. Also I see four legs under your bed, in the gallery in store I only saw one. Hoping it does come with four. You’ll just want to use a plywood dimension that’s the size of the mattress. The bed frame has just a little bit of extra room, but it’s not enough to change the measurement. Thank you for your helpful articles. Is this why you use the plywood over your slats? On a related note, I have read online that it is important to have gaps between the slats to ensure ventilation and prevention of mould – with this in mind, wouldn’t the plywood sheet affect ventilation? Keen to hear your thoughts on this, and thanks again. Yes, that’s correct. Flexed slats can work, but they can also interfere with the feel. If you think that may be happening it’s a good idea to add plywood or another type of solid surface to your bed frame. Thanks a lot for the reply and information! My pleasure, Mohammed! I’m glad it was helpful. Do you have a platform you recommend for a king size ghostbed? For the mattress and base to sit on. On some websites mention a maximum height requirement of 8 inches for your Bellmar by Copenhagen mattress. Is this true for your mattress? Do you have any issues or for see any using a low profile foundation with a 13 inch mattress? In any case, it’s probably more of an aesthetic thing…as mattresses 8″ or taller go further up the headboard. The slats on the Bellmar aren’t amazing, but for most they are fine. If they do seem like they aren’t providing enough support you can always add a 3/4″ sheet of plywood to essentially turn the Bellmar into a true platform. Do you use plywood over the slats? Yes, I recently added a sheet of 3/4″ plywood on top. It helps to improve support. Just make sure your plywood sheets are absolutely flat. I have two separate plywood sheets, one is great the second is a bit warped. While it doesn’t really impact support, it does make noise as it’s moving from side to side along the warped curve. Do you have any information on the Zinus Platform beds? They seem like a good option…but they are on the cheap side, so that is a bit worrisome. Unfortunately, I have not personally tested the Zinus platform bed. I have tested the Smart Base, which was quite good. If the platform bed is anything like the Smart Base, I believe you will be okay. Additionally, several readers have told me many good things about the Zinus platform bed. The price may be low, but I’m sure it’s a quality product. Would this work with a purple mattress or do I need to use plywood over the slats? Flexed slats can work…however, the Purple, and really any mattress will perform better with a solid surface. If you can add the plywood I highly recommend it. 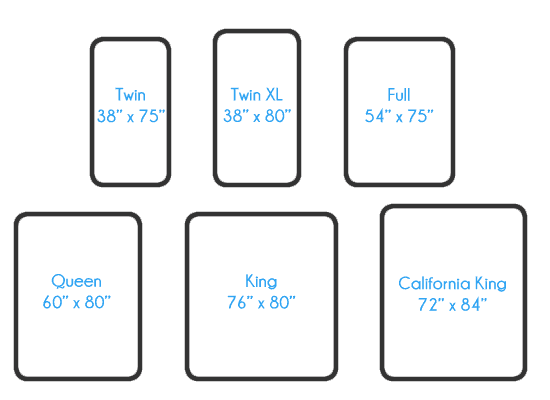 Just passing along some information – I too was looking for the Bellmar in a California King size. I called Copenhagen and this frame is not made in that size, and the manufacturer (Kinwai) doesn’t take special orders. Sleepopolisia/Scandinavian Designs does have the Piccolo Bed which is extremely similar, but the legs and corners appear to be polished instead of brushed, and the headboard is split. The Piccolo Bed can be ordered in any size. A couple of questions, thanks for taking the time … it looks like this bed is becoming hard to find. I think that Scandinavian Designs AKA Sleepopolisia(?) have replaced it with a very similar “Piccolo Bed”. So, I was wondering if you think it’s practical to place something like a Leesa on this? I see you have concerns about foam on slats. What else would you do? I think the low profile is great and would not want to ruin it with a boxspring or whatever. Is there something else that can be done? You could use this frame, or any slat frame, along wide a 3/4″ sheet of plywood on top. That would in effect work at a true platform bed and would create an ideal surface for virtually any mattress. If you have support issues or concerns, but don’t want to give up the clean look, that’s the best way to go. you got me looking into this Leesa mattress ? does it need a box frame or anything special underneath? or will it work out same if I just throw it on the ground and use it as is ? Thanks again! Happy to help! Either or will be just fine as long as you have solid support underneath the Leesa you will be just fine. I really enjoy your blog, as it has been quite informative as I look for a new mattress. Yep! That should work fine for BB. Zinus makes a solid frame. That’s a good question. Unfortunately, I don’t know the answer. I have a King frame. I’d be surprised if they don’t sell a Cal King. I’m anticipating purchase of 3 Leesa mattresses. King. Double and a n ex LongTwin. Can these mattresses be placed atop existing bix springs that sit on traditional metal bed frames? If the boxspring is in good shape, it should be okay. A boxspring that is more traditional and uses actual springs is less than ideal. Ideally it’ll be on an wooden box foundation, platform bed, or slat frame. Alternatively, you could use a bunkie board with your boxspring or even a 0.75″ sheet of plywood to add the level of support you need. I’ve a beautiful bed that’s built with a few slats for a traditional innerspring coil on coil box spring and mattress. I want to switch it to a foam mattress. It looks like Loom & Leaf is my best option because they can send a foundation too. Problem: the set is too high for the bed frame. Is there a way to convert the bed to a platform bed? An internet search yields lots of questions and not very good answers. For starters, Loom & Leaf does offer a low profile (4.5″) boxspring. Would this setup also sit too high for your bed? If so, I’m not entirely sure the best way to convert your bed into a platform bed. If possible, I would try to add slats to the bed. This would allow for much better support and the potential to sleep without a boxspring. Hey we bought this bed from Copenhagen, do you happen to have the directions? Ours did not come with the directions? Any assistance would be greatly appreciated. Unfortunately, I do not. They assembled my bed for me when I ordered it, so I’m afraid I wouldn’t be of much help. I would contact Copenhagen Furniture directly to see if they have it. Would the plywood take the place of a foundation or would it be in addition to the foundation? It would take the place of the foundation, provided it’s used with a slat frame. It’s not a perfect solution, but it should be a marked improvement. If you’re less than 200 pounds I’d say the Bellmar will be fine as is. If you’re more than 200 pounds you may want to add a 3/4″ sheet of plywood to the base, which will reinforce the support in the same way a platform would. Aesthetically, I love the Bellmar. However, I do wish the slats were rigid, which would provide better support. 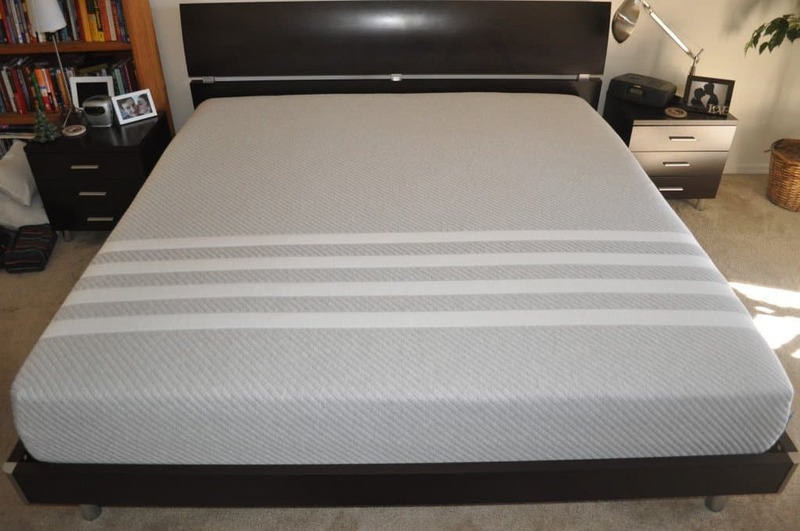 For all of my mattress reviews I test the mattress on multiple bed frames and foundations to assess performance. The flexed slats usually mean a little worse support and a little softer feel. If you like the general feel of the Winkbed, but you don’t love it, then your other options would be the Saatva or Voila. The Bellmar does come with slats, however, they are flexed slats, and not ideal for the Winkbed (or really any mattress for that matter). You could use the slats + a bunkieboard or low profile foundation. Otherwise, I would recommend getting a full wood foundation. A solid and strong foundation is essential to providing great support and getting the most performance out of your mattress. I’m actually working on a video now showing the differences between different types of foundations. The short version: solid built all wood, rigid slats with minimal separation, or a full platform are the best choices. are these easy to disassemble if i am moving? Indeed. I recently moved and between my wife and I we were able to disassemble and reassemble in a short amount of time. Took about 30 minutes to take apart and about 45 minutes to put back together.